A sale by auction of goods taken in distress for assessed taxes was announced to take place at Ashton Tavern on the 16th May , at Birmingham. From forty to fifty persons attended, including some brokers, but no one could be found except the poor woman from whose husband the goods had been seized, and the auctioneer himself. A man came when the sale was nearly over, who was perfectly ignorant of the circumstances under which it took place, and bid for one of the last lots; he soon received an intimation, however, from the company that he had better desist, which be accordingly did. After the sale was over nearly the whole of the persons present surrounded this man, and lectured him severely upon his conduct, and it was only by his solemnly declaring to them that he had bid in perfect ignorance of the nature of the sale that he was suffered to escape without some more substantial proof of their displeasure. It’s hard for me to tell from this brief report, but this was possibly part of the tax resistance campaigns conducted by Political Unions in England in the 1820s and 1830s. In the sixth section of the second book of The Nicomachean Ethics , Aristotle reminds his audience that virtues occupy a “just-enough” sweet spot between the vices of excess & deficit, and that in the same way that there’s only one place to hit the bullseye and many places to miss it, virtues are small and contained while vices are vast and easy to come by. You may remember that a while back I expressed some doubts about Aristotle’s Goldilocksian theory of virtue, suggesting that it was too dependent on accidents of language and not very informative. 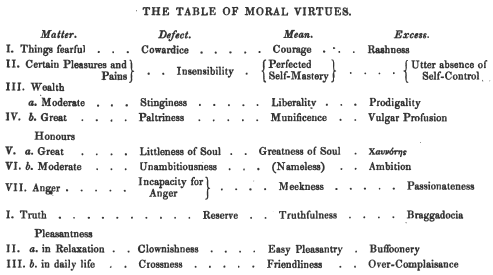 In this section, Aristotle answers the criticism by acknowledging that some things we call vices are wrong in any amount (there is no improper deficit of the vice, or some ideal amount of the vice to have) and some things we call virtues are perfections (you can’t have too much of them). He says that this is because our words for those vices are actually shorthand words for an excess or deficit of some trait — so for instance, “cowardice” is a vice, but it’s really shorthand for “a deficit of bravery” — and our words for those virtues are shorthand words for the golden mean itself — so for instance, you can’t be too “temperate” because the word itself defines someone who has found the mean between self-indulgence and asceticism. You shouldn’t expect to find extremes of something which is implicitly a mean, nor a mean of something which is an extreme by definition. This goes some way toward answering my objection, but I’m still not convinced. I can’t answer my original questions (“Can you be too healthy? too beautiful? too wise?”) using this logic without really stretching the concepts to the breaking point. Is “healthy” implicitly a mean between an invalid and, uh, a muscle-bound showpiece? Is “wise” really a mean between stupid and, uh, overintellectual? Is “beautiful” really a mean between ugly and, uh, saccharine-pretty? It seems more intuitive and less of a stretch just to think of those terms as representing extremes on dimensions in which there is no vice in aiming for the extreme, contra Aristotle’s rule. In section seven, Aristotle gives some examples of how his “just-enough” rule applies to a variety of specific virtues. In some of these cases, one of the extremes is rare enough that there isn’t a word for it and it’s a little difficult to imagine. Some of his examples seem to be real stretches, but I can’t tell if this is just because of inevitable inexactitudes of translation. In any case, I get what he’s aiming at and wonder why he’s going on at such length about it. Section eight is more refinement of the theory, but mostly stuff that to me seemed pretty obvious and hardly worth mentioning.